The Stylistics are a Philadelphia soul group that achieved its greatest chart success in the 1970s. They formed in 1968, consisting of singers Russell Thompkins Jr., Herb Murrell, Airrion Love, James Smith, and James Dunn. All of their US hits were ballads characterized by the falsetto of Russell Thompkins Jr. and the production of Thom Bell. During the early 1970s, the group had twelve consecutive R&B top ten hits, including "Stop, Look, Listen", "You Are Everything", "Betcha by Golly, Wow", "People Make the World Go Round", "I'm Stone in Love with You", "Break Up to Make Up", and "You Make Me Feel Brand New". The Stylistics were created from two Philadelphia groups, The Percussions and The Monarchs. Russell Thompkins Jr., James Smith, and Airrion Love came from the Monarchs, and James Dunn and Herbie Murrell came from the Percussions. In 1970, the group recorded "You're a Big Girl Now", a song their road manager Marty Bryant co-wrotewith Robert Douglas, a member of their backing band Slim and the Boys, and the single became a regional hit for Sebring Records. Producer Bill Perry spent $400 to record the song in the Virtue Studios in Philadelphia. The larger Avco Records soon signed the Stylistics, and the single eventually climbed to number seven on the US Billboard R&B chart in early 1971. After signing to Avco, the record label approached producer Thom Bell, who had already produced a catalogue of hits for The Delfonics, to work with the group.The Stylistics auditioned for Bell, but he was initially unimpressed. He ultimately agreed to produce the group because he believed in the potential of lead singer, Russell Thompkins, Jr.'s distinctive, nasal high tenor & falsetto voice. Avco gave Bell complete creative control over the Stylistics and he proceeded to focus the group's sound exclusively around Thompkins's voice. On most of the group hits, Bell would have Thompkins sing virtually solo. The first song recorded with Bell and his collaborator, lyricist Linda Creed, was the lush "Stop, Look, Listen". Bell imported techniques he had perfected with The Delfonics and his musical arrangements worked perfectly with Thompkins' falsetto vocals. Their hits from this period —distilled from three albums— included "Betcha by Golly, Wow" (U.S. #3), "I'm Stone in Love with You", "Break Up to Make Up" (U.S. #5), "You Make Me Feel Brand New" featuring Thompkins singing a rare lead vocal duet with Airrion Love, the aforementioned "Stop, Look, Listen", "You Are Everything", and the Top 20 Pop hit "Rockin' Roll Baby" (U.S. #14). "You Make Me Feel Brand New" was the group's biggest U.S. hit, holding at No. 2 for two weeks just as the spring of 1974 turned to summer, and was one of the group's five U.S. gold singles. 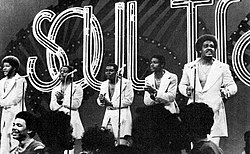 The Stylistics' smooth sound also found an easier path on to adult contemporary airwaves than many other soul artists and the group made Billboard magazine's Easy Listening singles chart twelve times from 1971 to 1976, with three entries ("Betcha by Golly, Wow", "You Make Me Feel Brand New", and "You'll Never Get to Heaven (If You Break My Heart)") reaching the Top 10. Every single that Bell produced for the Stylistics was a Top Ten R&B hit, and several—"You Are Everything", "Betcha by Golly Wow! ", "I'm Stone in Love with You", "Break Up to Make Up", and "You Make Me Feel Brand New"—were also Top Ten pop chart hits. The group also enjoyed commercial success with big hits with this material throughout Europe. Thom Bell stopped working with the Stylistics in 1974, and the split proved commercially difficult for the group in the U.S. Just as with the Delfonics, the Stylistics were to some extent a vehicle for Bell's own creativity. They struggled to find the right material although their partnership with label owners Hugo & Luigi as producers and arranger Van McCoy started well with "Let's Put It All Together" (#18 pop, No. 8 R&B) and "Heavy Fallin' Out" (#4 R&B, No. 41 pop). Following singles were notably less successful, but as U.S. success began to wane, their popularity in Europe, and especially the United Kingdom, increased. Indeed, the lighter 'pop' sound fashioned by McCoy and Hugo & Luigi gave the group a UK #1 in 1975 with "Can't Give You Anything". Further successes with "Sing Baby Sing", "Na Na Is The Saddest Word", "Funky Weekend" and "Can't Help Falling in Love" consolidated the group's European popularity. They are one of the few U.S. acts to have two chart-topping greatest hits albums in the UK. The Stylistics switched record labels during this period as Avco Records transitioned into H&L Records in 1976. Notwithstanding this, the band began to struggle with increasingly weak material, and although the singles and albums came out as before, by 1978 chart success had vanished. A move to Mercury in 1978 for two albums produced by Teddy Randazzo failed to produce any major success. Russell Thompkins Jr. wrote (in the sleevenotes for the re-issue of the 1976 album, Fabulous) that the group began to feel that the music they were recording was becoming dated and not in keeping with the popular disco sound of the late 1970s. In 1979, they had a small part in the movie Hair, directed by Miloš Forman, where they play conservative army officers. They double Nell Carter in singing a tongue-in-cheek song called "White Boys". Both James Dunn and James Smith departed in 1980 due to conflicts over the direction of the group. The group continued, recruiting new member Raymond Johnson. They would also reunite with Thom Bell and sign with Philadelphia International Records subsidiary, TSOP Records in 1980. They released the single, "Hurry Up This Way Again", that year which brought them back into the R&B Top 20 (peaking at #18). Johnson departed in 1985, leaving the group a trio. Love, Murrell, and Thompkins continued to tour until 2000, when Russell Thompkins, Jr. left the group. Love and Murrell brought in two new members from one set of the Delfonics – (Harold) Eban Brown as lead singer, and tenor singer Van Fields who also sang with an a cappella group called A Perfect Blend. In 2011, Fields departed from the group due to creative differences and was replaced by Jason Sharp (formerly with the band Heatwave). The group, prior to Fields' departure, was featured live on the DVD The Stylistics Live at the Convocation Center (2006), as well as with other artists of the 1970s on the DVD, 70s Soul Jam. They recorded their latest album, That Same Way, in 2008. Russell Thompkins, Jr. launched his own group in 2004, the New Stylistics, with the returning Raymond Johnson, plus James Ranton and Jonathan Buckson. They were featured on the DVD Old School Soul Party Live!, which was part of the PBS My Music series. In 2006 their hit single, "Can't Give You Anything (But My Love)", was used as the base for a Japanese advertisement campaign by Gatsby, to launch their new male hair styling product, 'Moving Rubber'. The campaign was successful and featured one of Japan's most popular celebrities Takuya Kimura of the pop group SMAP. They were also featured guests on SMAP's television show, SMAP×SMAP, one of the highest rated shows in Japan to promote the 'Moving Rubber' product. In October 2009, they featured on the UK BBC One television program, Friday Night with Jonathan Ross. Their song, "People Make the World Go Round", was used by Spike Lee in the soundtrack for 1994 film Crooklyn, as performed by Marc Dorsey. In January 2018 Eban Brown announced his departure to concentrate on his solo career. He was initially replaced by Michael Muse, formerly of Rare Essence; but by July 2018 had been replaced by former Temptation Barrington Henderson.